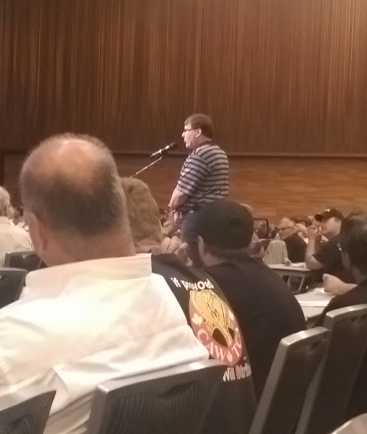 During the first Unifor Canadian Council held at the Vancouver Convention Centre September 13 to 16, 2014, delegates from Unifor’s four Rail Locals – Council 4000, Local 100, Local 101-R and Local 103 – met to discuss, debate and ultimately pass the draft bylaws of the first ever Industry Council for Unifor’s 9,000 members employed at Canada’s railways. Unifor is establishing a number of Industry Councils from amongst the various economic sectors of the Union, which besides Rail, includes: Aerospace, Auto, Aviation, Energy, ETOP, Fishery, Forestry, Health Care, Hospitality and Gaming, Independent Parts and Suppliers, Media, Mining Metals and Minerals, Retail Wholesale, Road Transportation and Speciality Vehicle, and Telecommunications. The Unifor Rail Industry Council will meet, at minimum, once per year in conjunction with Unifor’s Canadian Council and at additional times at the call of the Rail Council Executive. The Rail Council Executive will conduct conference calls as deemed necessary, or meet in conjunction with other Unifor conferences, meetings and events. Delegates to the founding Unifor Rail Industry Council also supported the motion to have the new Chairperson of the Rail Council, Ken Hiatt, serve as the representative on the Unifor National Executive Board (NEB) on behalf of the Rail sector. Thanks to Heather Grant, Secretary Treasurer of Unifor Council 4000, who has served on the NEB as the representative from Transportation since the founding convention of Unifor for her contributions. With the establishment of the various new Industry Councils, Transportation was split up with Auto, Aviation, Rail, and Road Transportation and Speciality Vehicle forming their own, separate Industry Councils of which would determine whom would represent that industry on the Union’s NEB, in keeping with the terms of Article 11 of the Unifor Constitution.